While K-12 education issues were rarely mentioned in the 2016 presidential campaign, President-elect Donald Trump’s proposal to give children taxpayer-funded vouchers to attend a range of schools, including private schools, could find fertile ground in his administration. The idea has never been popular among California voters, and union leaders and those close to them view it with trepidation. Few education issues were raised by either Clinton or Trump during the campaign, so his $20 billion “school choice” plan stands out. Trump proposes to give government-funded vouchers to all low-income children in the United States to attend schools of their choice. He derisively referred to public schools as “failed government schools.” He said that it was a “civil right” for millions of inner city children “trapped” in those schools to be able to attend schools of their choice – whether private schools, charter schools, magnet schools or traditional public schools. “There is no failed policy in more urgent need of change than our government-run education monopoly,” he said. Although California offers parents a generous choice of charter schools, Californians have not been receptive to the idea of issuing vouchers for private schools, and have twice rejected propositions that would do so at the ballot box. The first time was in November 1993 when voters decisively defeated Proposition 174, titled the “Parental Choice in Education Initiative,” by a 69 percent majority. The initiative would have required the state to provide a voucher for every school-age child equal to at least half of what the state spent per pupil on K-12 public schools. The principal author of the ballot argument in favor of the proposition was William Bennett, who had been education secretary under President Ronald Reagan. “Let’s take back control of our schools by breaking the iron grip of overpaid administrators, powerful union bosses and timid school board members,” wrote Bennett and his co-signatories, sounding strikingly similar to Trump’s pronouncement in 2016. “There will be tons of support for charters. Full-scale private choice will be a battle,” said Vic Klatt, a principal of the Penn Hill Group and former staff director of the House Committee on Education and Labor. To try to head off passage of the initiative, the state Legislature approved a law in 1992 allowing for the establishment of charter schools in order to offer parents greater school choice. California was only the second state to pass a charter school law. The original law limited the number of charters to 100 in the entire state, and a maximum of 10 in any one district. Los Angeles Unified was allowed to have 20. But the Legislature soon afterwards lifted the cap, which is now set at 2,050 schools. The law has been stunningly successful in opening the door to charter school expansion. As of last year there were 1,230 charter schools in the state. 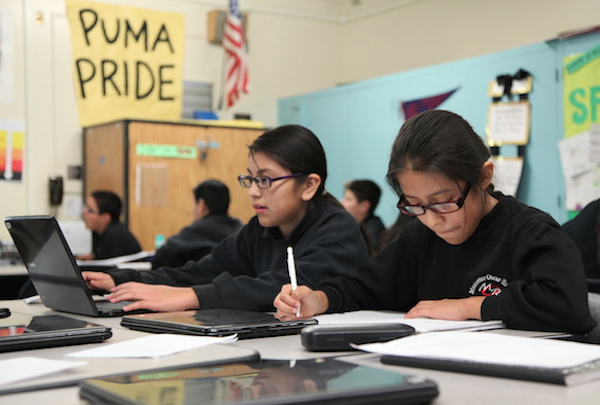 This year, according to Jed Wallace, president of the California Charter Schools Association, there are 600,000 children in charter schools, or about 10 percent of the state’s public school enrollment. California voters had a chance to weigh in on the issue of school vouchers once again in 2000, with Proposition 38. The initiative would have authorized the state to issue vouchers of up to $4,000 annually that parents could spend on tuition at private and parochial schools. The main proponent and backer of the initiative was venture capitalist and billionaire Tim Draper, who poured $22 million of his money into the initiative. Other backers included his father William and Jerry Perenchio, former president of the Spanish language television network Univision. The California Teachers Association spent an equal amount of its money to defeat the measure, which was decisively rejected by voters by a 70.6 percent to 29.4 percent margin. Gerard Robinson, widel reported to be a member of Trump’s transition team, and a former state education chief in Florida and Virginia, told the Washington Post that he thinks Trump will try to expand school choice programs in some form or another, even if it isn’t the $20 billion plan he proposed on the campaign trail. “He’s going to make a push for parental choice,” Robinson said. One reason Trump’s voucher plan is likely to gain traction is that it is almost certain to get strong support from Trump’s Vice president-elect Mike Pence. While governor in Indiana, he was a major supporter of a voucher plan there. In Indiana, 33,000 students have used the voucher plan to enroll in private schools, among the largest number in any state. Although the GOP now controls Congress, there is no assurance a voucher plan will pass. Last year, for example, Sen. Lamar Alexander, R-Tenn., the chair of the Senate Health, Education, Labor and Pension Committee, introduced a $23 billion federal voucher plan. As a former secretary of education, Alexander arguably has more clout on education matters than anyone in Congress. But the legislation only got 45 votes on the Senate floor, with several mostly moderate Republicans voting against it. At an Education Writers Association panel discussion in Washington D.C., last week, Vic Klatt, a principal of the Penn Hill Group and former staff director of the House Committee on Education and Labor, predicted a fight in Congress over the issue, with some lawmakers from both sides of the aisle lining up against it. It would be a great victory for social justice if this voucher plan got through. It would extend the option of private education to many who can’t afford it now. It would enable many families who want to stay in the city but want an alternative to the city school district (such people, by the way, are not all white) to stay in the city. The next administration should emphasize school choice — private, chartered, and magnet, in addition to the traditional public that is the only choice for too many families — as helpful everywhere and a potential solution to the disaster that is education in the nation’s second largest city, Los Angeles, where powerful union bosses and timid school board members still mismanage a sanctuary district in danger of losing its federal education funding, leaving desperate families needier than ever, at least until the rule of law is reestablished in a city in long decline. Don’t let facts get in the way of your argument. It would have spent a vast amount of tax money providing vouchers for the privileged as well as the low-income — those low-income students whom a private school would have accepted, anyway. Most of the funds would have gone to the privileged. No private schools would have been required to accept voucher students, so the most vulnerable and high-need would have been undoubtedly left out. Challenged, high-need students from impoverished, unstable homes are not sought after by private schools. The vouchers wouldn’t have been enough to cover tuition at any but low-rent, bare-bones private schools, so the notion that disadvantaged children would have enjoyed the same education as the privileged was false. The private-school community hasn’t been all that enthusiastic about voucher programs, because they’re afraid that a next step would be to require them to accept students whom they didn’t want to accept. *It’s not that well known that Draper said this. He said it at an education forum at Grace Cathedral in San Francisco, and a recording of the forum was posted on Grace Cathedral’s website — yes, even in 2000! A friend who had attended the forum told me about it. I wrote an anti-Prop. 38 op-ed for the San Jose Mercury News, and included that information, and the op-ed editor challenged me on it and listened to the recorded Draper comments before he accepted it and let what I’d written stand, since there was no other mention of the comments to be found. Also, we need to eliminate LIFO and have part of teachers’ pay based on test scores adjusted to reflect the previous year’s test scores and demographics of the students. We need to make it easier to fire bad teachers and raise the pay of good teachers so our schools are competitive with private schools. We need to create opportunity for all.